The first string braid top is done. 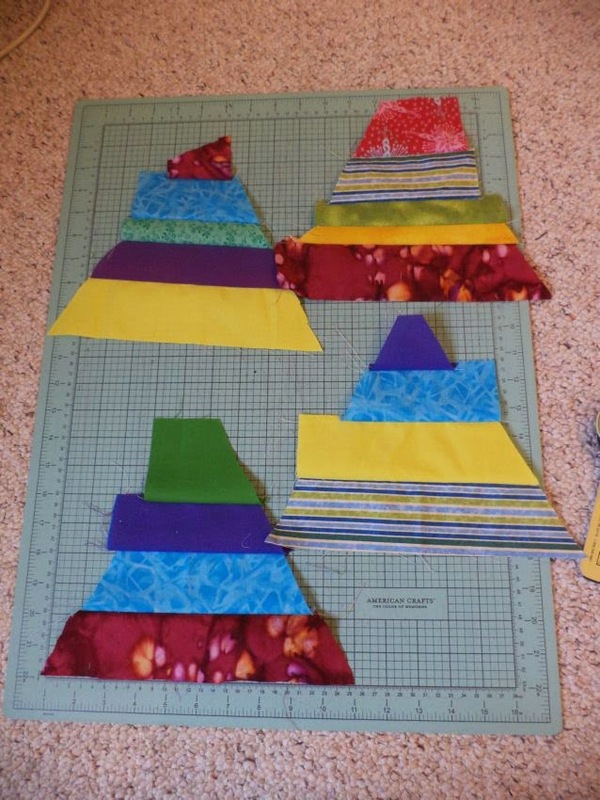 I say "first" because I still have plenty of triangles left, so there will be at least one more quilt to come. This top measures 70" x 56". This is still part of the series of string quilts I am making after sorting my strips a few month ago. The first was the blur and brown string quilt here. 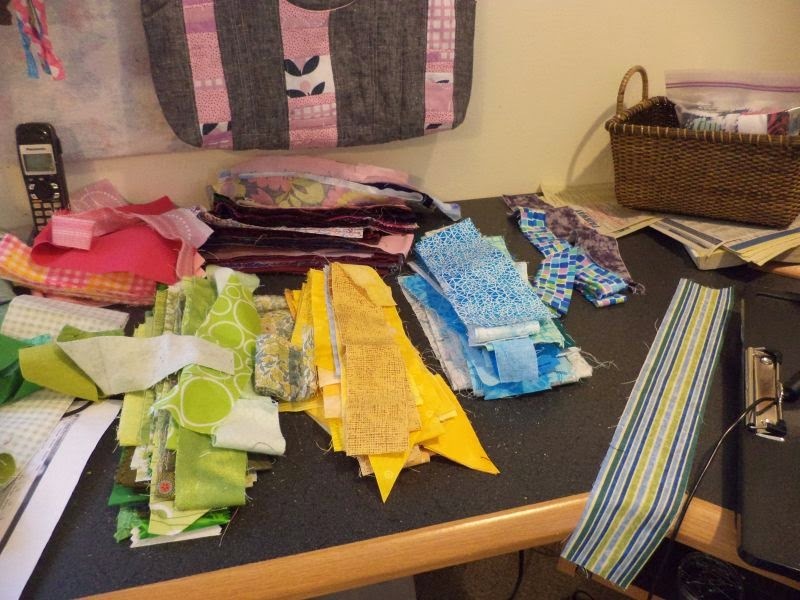 Organized scraps are so inspiring! 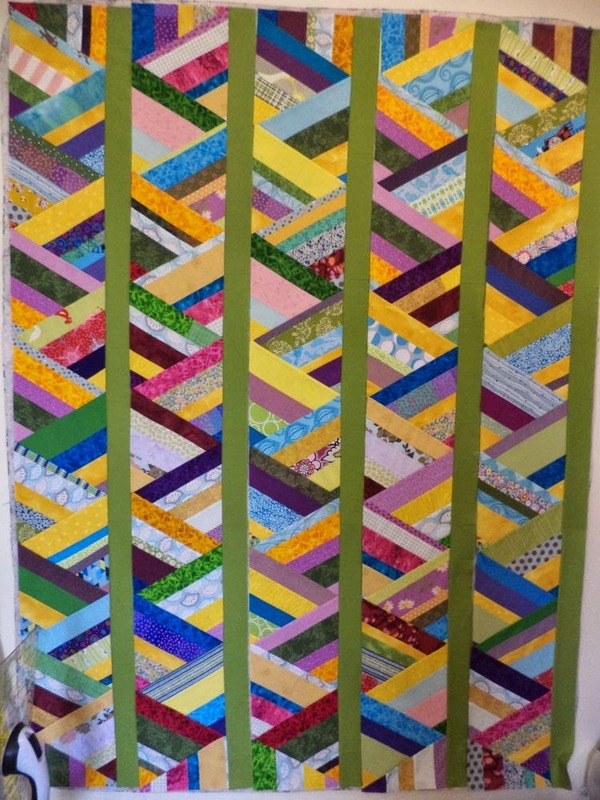 This design comes from the blog American Quilting. Several commenters asked her for the pattern but I don't think she was able to find one. There may not be one. It's a simple enough design to make and perfect for eating through scraps. The triangles can be made in two ways. You can piece together shorter scraps into a rough triangle shape. Lay your ruler over them as you go to make sure all the pieces are long enough. Press, with STARCH (I have never used starch before, but it was a lifesaver this project. There are plenty of recipes to make your own on google). Then cut out using a 60 degree triangle ruler. For the longer strings, piece them into strip sets that are just wider than your ruler and press, again with starch. 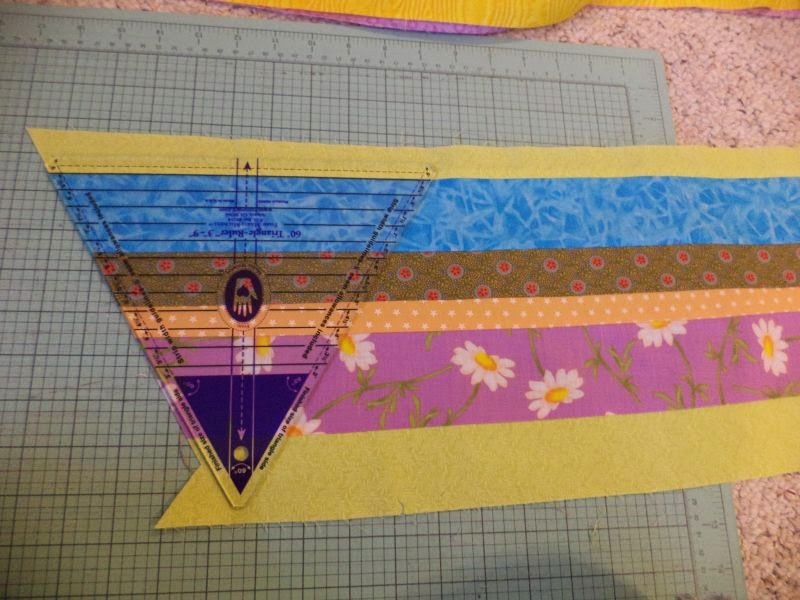 Then cut triangles, alternating the direction of your ruler as you go. And that's how you make 60 degree triangles from your scraps. Arranging them in columns as I did in the first picture make a braid effect. 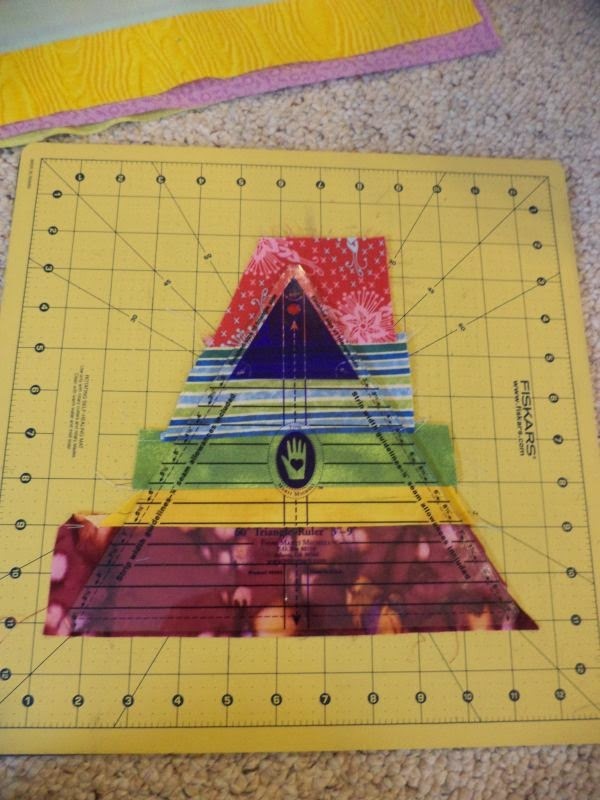 I am planning to experiment with some other layouts in the next quilt(s). I hope this tells you what you need to know to make your own string braid, please email or comment with any questions! 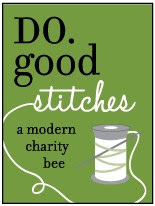 Linking to WIP Wednesday at Freshly Pieced and Oh SCRAP! at Quilting is More Fun than Housework. This is very cool! I just love how it comes together! 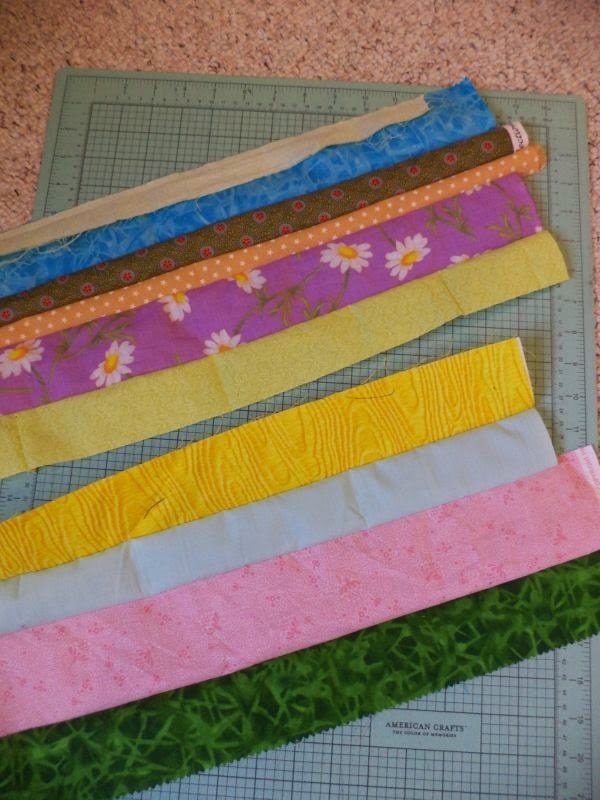 Great idea for sewing up scraps. Thanks for sharing your process and top with Oh Scrap! And the tip on using starch is a good one! I love it, thanks for the idea! I am trying to use some strings up too! Lovely idea with the triangles. I would love to try this too! That is too cool! Looks like I need to invest in a triangle ruler.